Download Task Factory and you'll be sending files to and from your SFTP server in minutes without writing a single line of code in SSIS. 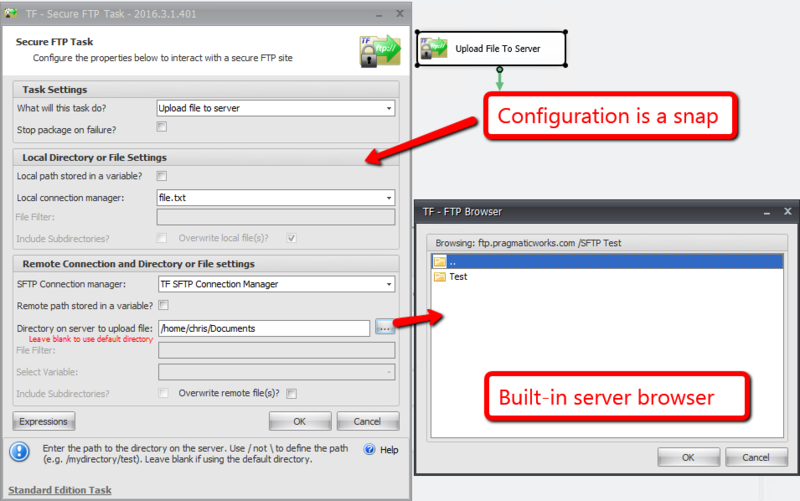 The Task Factory Secure FTP (SFTP) Task is easy-to-use with SSIS. In as little as one minute, you'll have the task configured and ready to go without writing a single line of code. The SFTP Task works with SSH, Implicit and Explicit SFTP Servers. Not only does the SFTP Task work with all SFTP servers, it also works with the far less supported Implicit FTPS and Explicit FTPS servers. Which means it works with your SFTP server. You can do more than just upload and download files. The Secure FTP Task uploads and downloads files with ease. But it's functionality doesn't stop there; you can execute virtually any type of activity you need to perform with your SFTP server.